Tom Morton has re-written Frontier Elite 2 to work under the OpenGL graphics system, and the result is a great-looking game which will run under Windows and other systems. 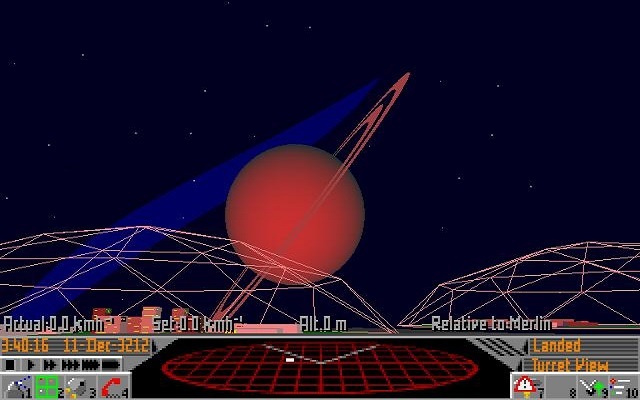 The game shows a considerable improvement in the quality of the graphics, as the screen grabs below illustrate. As with the hi-res version of FFE, GLFrontier remains essentially the same game as the original version, but the visual side of things is of a much higher quality. The cockpit is the same as the original, but this is no problem as it has always worked so well. In this program, the ships do not benefit from the increased resolution as much as they do in glFFE, although there are some details visible for the first time. The major work has been in the rendering of planets and stars, which have changed almost beyond recognition.